Runtime: 1 hour 54 minutesWhat is this? Tim (Rudd) is an executive for “Fender Financial” and is looking to move up to the 7th floor after seeing one of their top executives being fired. He has been asking his artistic girlfriend, Julie (Stephanie Szostak) to marry him, to no avail. Tim finally may get his wish now, as he impressed his boss during a meeting, pulling in a potential billionaire client. All he has left to do is attend a dinner, and invite a guest. The only catch is, his guest has to be the biggest “idiot” at the dinner. That’s where Barry Speck (Carell) comes in. He is a nice guy with the hobby of using dead mice in people situations (ie: The Last Supper). After a mix-up, thanks to Barry, Julie leaves and Barry is left wondering if she is going to cheat on him. What We Think? 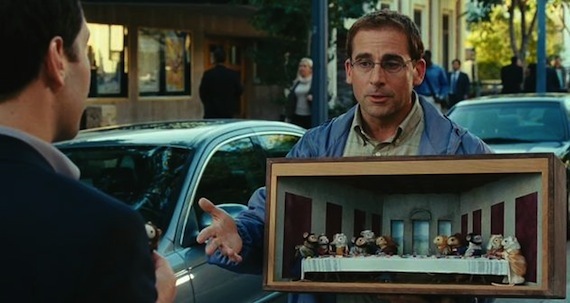 Dinner for Schmucks is based off of the 1998 French comedy, The Dinner Game. Written and directed by Jay Roach, DFS brings together Anchorman and 40 Year Old Virgin co-stars, Paul Rudd & Steve Carell. Schmucks runs on the fuel of the classic comedic technique of “Murphy’s Law” – anything that can happen will. Because of this interference, it makes the movie just a tad more predictable, as if it wasn’t already. Carell & Rudd both work together very well, considering their past on the silver screen. The one thing that makes this movie acceptable in some senses, is the two leads. Carell & Rudd are two very likeable stars, especially Carell, because of his ability to do basically whatever a script tells him to do. Both of them are very well liked and very well respected stars, and their characters really shine throughout the movie. This isn’t to say that it is BECA– USE of Steve & Paul that this movie is rated the way it is. There is also the comedic factor. Aside from it’s predictability, we do see some good touches of humor and sweetness throughout the movie. It’s originality, despite being based off of a French comedy is still accepted, as we haven’t seen anything like this one before.